The Autism and Developmental Disabilities Monitoring Network (ADDM) and the Centers for Disease Control and Prevention (CDC) report that in 2002 approximately 10% of all 8-year-olds in the United States had an Autism Spectrum Disorder (ASD). If these findings are correct, by next year 10% of all 18-year-olds in the United States will have an Autism Spectrum Disorder. The report does not account for the thousands of other people with ASD, in different age groups, who were not included in the study. Nor does it indicate where the study participants fall within the spectrum. However, it does verify that an astounding number of adults with ASD are about to enter the workforce, enroll in college, look for adult services or risk falling through the cracks of a limited service delivery system. We must prevent the latter. The first measure of prevention is to eliminate the all too common shock to families and to individuals with ASD themselves upon learning that entitlements once secured during a student’s school years by the Individuals with Disabilities Education Act (IDEA) have disappeared. All American school age children are entitled to a free and appropriate education in the least restrictive environment. Under IDEA, students who have a wide range of disabilities, defined in the law’s 13 categories, are entitled to receive the services or educational modifications necessary to complete their free and appropriate educational career. When school ends, however, these entitlements end, too. Without preparation, families and people with autism suddenly find themselves navigating an entirely new and complex world of adult services. It is critical to understand specific laws that have shaped adult services and access to them when a student transitions from school. The Americans with Disabilities Act (ADA), for example, is designed to ensure that people with disabilities are offered reasonable accommodations to access public places and activities. Additionally, according to the Keiser Commission on Medicaid and the Uninsured, the 1999 Supreme Court ruling in Olmstead v. L.C. requires states to “provide services to persons with disabilities in community settings rather than institutions, if certain conditions are met” in order to comply with the ADA. If you begin to look closer, however, the only people to meet the “certain conditions” are those with severe disabilities, who need long-term services equivalent to institutional or nursing home care, and who have Medicaid. Although the Americans with Disabilities Act protects adults with Asperger syndrome in circumstances where they only require reasonable accommodations (i.e. in college or in their workplace), the same individuals are not entitled to services they may need to succeed in those environments. In this way, protection does not equal provision for this population. The person must prove (with medical documentation) that he/she has a physical or mental impairment that substantially interferes in his/her ability to work. The person must prove that he/she needs vocational services to obtain and retain employment. The person must show that any VR service he/she is requesting and/or receiving must be directly related to getting and keeping employment. The VR counselor who reviews the initial application for services is responsible for determining eligibility and informing the applicant of the decision. Whenever the VR agency does not have the funding on hand to provide services to all applicants who are deemed eligible, the agency may implement an “Order of Selection” (known to most as a waiting list), which is based on three tiers of need. The first tier includes eligible people with two or more significant disabilities. The second includes eligible people with one significant disability, while the third is for people with non-significant disabilities. Under such circumstances, an eligible person with strong intellectual abilities, such as an individuals diagnosed with Asperger syndrome, may not get the time limited vocational services he/she needs in order to succeed. In this way, eligibility for services does not equal obtaining services. More and more young adults with Asperger syndrome who have college degrees have been told that they are too intellectually superior to qualify for adult developmental disabilities services. Yet, they are often too socially impaired to get and keep a job independently. When these programs fail them, young men and women with diagnoses like Asperger syndrome are faced with either entering federally defined poverty levels in order to apply for social services and Medicaid, or taking their chances as unemployed and uninsured citizens. This is when the phrase “falling through the cracks” becomes most palpable. Our current economic crisis and shortage of appropriate vocational services for people with Asperger syndrome have provided new impetus to find and design other means of prevention. Newly formed and existing consumer driven groups, such as the Asperger Syndrome Training and Employment Partnership (ASTEP), are combining forces with voluntary agencies, universities, philanthropic organizations, foundations, and civic minded companies to create jobs for motivated and able people who have an ASD. 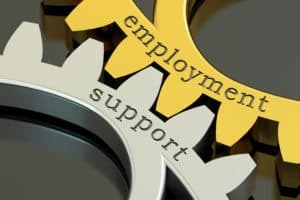 ASTEP is taking a unique approach in creating employment opportunities for people with ASD by focusing on the significant benefits to corporations and other large employers that people with Asperger syndrome can bring. Our organization’s primary goals are to train employers about the benefits of expanding their diversity policies to include people with ASD and to work with companies to hire highly qualified job candidates into appropriate professional positions. Additionally, ASTEP offers vocational training/rehabilitation providers and college support programs tools and training for identifying and preparing adults with ASD to fill such positions. Finally, job site training for company managers and co-workers helps in fostering natural supports for the employee with ASD. Our goal is to help national employers increase their bottom line, reduce costly turnover and recruitment rates, and enhance quality production by employing focused, dedicated, professionals who happen to have an Autism Spectrum Disorder. This is how innovation in employment can begin to fill the cracks. Susan Lesco, MS has worked with people who have Autism Spectrum and other developmental disorders, and their families, for more than 25 years. She is currently the Director of Program Partnerships at the Asperger Syndrome Training & Employment Partnership (ASTEP), based in New York City. She has published numerous articles, presented parent and professional training sessions, worked as a vocational rehabilitation instructor, parent support group leader, and residential program director. Ms. Lesco holds a Bachelor of Science in Community and Human Services, and a Master of Science in Health Policy and Management, with a focus on Community Health and Patient Education, from Stony Brook University Health Sciences Center.